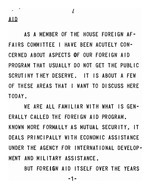 AS A MEMBER OF THE HOUSE FOREIGN AFFAIRS COMMITTEE I HAVE BEEN ACUTELY CONCERNED ABOUT ASPECTS OF OUR FOREIGN AID PROGRAM THAT USUALLY DO NOT GET THE PUBLIC SCRUTINY THEY DESERVE. IT IS ABOUT A FEW OF THESE AREAS THAT I WANT TO DISCUSS HERE TODAY. WE ARE ALL FAMILIAR WITH WHAT IS GENERALLY CALLED THE FOREIGN AID PROGRAM. KNOWN MORE FORMALLY AS MUTUAL SECURITY, IT DEALS PRINCIPALLY WITH ECONOMIC ASSISTANCE UNDER THE AGENCY FOR INTERNATIONAL DEVELOPMENT AND MILITARY ASSISTANCE. HAS SPREAD SO COMPLETELY THROUGH THE FABRIC OF OUR GOVERNMENT THAT TODAY MOST OF THE EXECUTIVE BRANCH IS INVOLVED IN SOME MANNER. WHILE WE TALK ABOUT A JUST-UNDER-2 BILLION DOLLAR FOREIGN AID APPROPRIATION JUST PASSED BY CONGRESS--A MEASURE, I MIGHT ADD, THAT I OPPOSEDTHE FACT OF THE MATTER IS THAT FOREIGN AID ANNUALLY REALLY COMES TO SOMETHING LIKE 10 BILLION DOLLARS WHEN YOU GET AROUND TO ADDING EVERYTHING UP. THERE IS MILITARY ASSISTANCE IN THE DEFENSE BUDGET; FUNDS FOR SUCH ORGANIZATIONS AS THE INTER-AMERICAN DEVELOPMENT BANK AND THE ASIAN DEVELOPMENT BANK, AID FOR MIGRANTS AND REFUGEES, THE PEACE CORPS AND EDUCATIONAL EXCHANGE PROGRAMS. TODAY I WILL DEAL WITH THREE AREAS OF AID THAT THE PUBLIC HEARS LITTLE ABOUT. THEY ARE PUBLIC LAW 480, KNOWN AS FOOD FOR FREEDOM PROGRAM, THE INTERNATIONAL DEVELOPMENT ASSOCIATION, SOMETIMES REFERRED TO AS THE SOFT-LOAN WINDOW OF THE WORLD BANK, AND OUR CONTRIBUTIONS TO INTERNATIONAL ORGANIZATIONS. LQA WAS SET UP A DECADE AGO BECAUSE THE POORER COUNTRIES, AND THE SO-CALLED DEVELOPING COUNTRIES, NEEDED MONEY AND COULDN'T GET IT ON WORLD BANK TERMS. PAID BACK OVER A PERIOD OF FIFTY YEARS AT NO INTEREST AND WITH ONLY A NOMINAL CARRYING CHARGE. I'VE OFTEN WONDERED WHY THIS UNIQUE ORGANIZATION GETS SO LITTLE PUBLICITY. I'M SURE MOST HARD-WORKING TAXPAYERS ARE UNAWARE THEY ARE SUPPORTING IT. BACK. WE WOULDN'T SEE IT AGAIN, ANYWAY, BECAUSE WE DONATE IT. SO FAR WE'VE DONATED OVER A BILLION DOLLARS. WHICH COMPARED WITH ONLY 18 CREDITS WORTH $107 MILLION IN THE PREVIOUS YEAR. PAKISTAN TO AN AMOUNT APPROACHING THOSE OF EARLIER YEARS, WHILE AT THE SAME TIME GREATLY INCREASING ITS LENDING TO OTHER COUNTRIES, NOTABLY IN AFRICA. AS A RESULT, THE PERCENTAGE SHARE OF INDIA AND PAKISTAN IN THE YEAR'S RECORD TOTAL OF \M. COMMITMENTS WAS REDUCED TO JUST OVER 50 PERCENT--39.6 PERCENT FOR INDIA AND 12.5 PERCENT FOR PAKISTAN." INDIA ONLY GOT A LITTLE OVER $152 MILLION FROM IDA LAST YEAR AND PAKISTAN $48 MILLION, SO WE CAN SEE ONE OF THE REASONS FOR LM'S DISTRESS. TO BE CARED FOR---SO WHEN HALF THE TOTAL IS GOING TO TWO, PAKISTAN AND INDIA, IT'S NO WONDER THERE HAS TO BE A REPLENISHMENT. BUT I VOTED AGAINST THIS RAID ON THE PUBLIC TREASURY FOR THE VERY SAME REASON I'VE OPPOSED THE SO-CALLED FOREIGN AID PROGRAM, WHICH IN ACTUALITY, AS I'VE POINTED OUT IN THIS DISCUSSION, IS ONLY ONE PART OF THE REAL AID PROGRAM. DOLLARS, MORE THAN HALF THE NATIONAL DEBT. THE INTERNATIONAL DEVELOPMENT ASSOCIATION IS JUST ANOTHER OF THOSE SPIGOTS FOR OUR DOLLARS TO GO ABROAD, OFTEN TO COUNTRIES THAT AREN'T EVEN FRIENDLY TOWARD US. IT IS ONE OF THE SPIGOTS YOU DON'T HEAR OR READ ABOUT, BUT IT IS A FOREIGN AID SPIGOT JUST AS MUCH AS IS THE DIRECT AID WE GIVE THROUGH THE AGENCY FOR INTERNATIONAL DEVELOPMENT, THE FOREIGN AID PROGRAM WE DO OUR BEST TO CUT TO REASONABLE SIZE EACH YEAR. LET US TURN NOW TO INTERNATIONAL ORGANIZATIONS. ORGANIZATIONS AND PROGRAMS TOTALED OVER $298 MILLION IN FISCAL YEAR 1968. THIS FIGURE INCLUDES ASSESSED CONTRIBUTIONS OF $115 MILLION TO 54 INTERNATIONAL ORGANIZATIONS; VOLUNTARY CONTRIBUTIONS OF OVER $170 MILLION TO 21 SPECIAL PROGRAMS AND CONTRIBUTIONS OF OVER $13 MILLION TO TWO U.N. PEACEKEEPING OPERATIONS. WE ARE ALL FAMILIAR WITH SUCH GROUPS WITHIN THE U.N. AS THE WORLD HEALTH ORGANIZATION, THE EDUCATIONAL, SCIENTIFIC AND CULTURAL ORGANIZATION, BETTER KNOWN BY THE ACRONYM UNESCO. AND THE INTERNATIONAL LABOR ORGANIZATION. FOR A MOMENT THAT WE CONTRIBUTE SUBSTANTIAL AMOUNTS EACH YEAR TO THE INTER-AMERICAN INSTITUTE OF AGRICULTURAL SCIENCES, THE INTER-AMERICAN TROPICAL TUNA COMMISSION, THE INTERNATIONAL INSTITUTE FOR COTTON, THE INDUS BASIN-TARBELA DEVELOPMENT FUND, WHICH IS INTENDED TO FINANCE SETTLEMENT OF A DISPUTE BETWEEN PAKISTAN AND INDIA OVER DIVERSION OF THE WATERS OF THE INDUS RIVER BASIN; THE U.N. CHILDREN'S FUND, BETTER KNOWN AS UNICEF. AND THE U.N. RELIEF AND WORKS AGENCY. WEIGHTS AND MEASURES; THE INTERNATIONAL COUNCIL OF SCIENTIFIC UNIONS AND ASSOCIATED UNIONS; THE INTERNATIONAL WHEAT COUNCIL AND THE INTERNATIONAL AGREEMENT ON MAINTENANCE OF LIGHTS IN THE RED SEA. ON THIS LAST ONE, WHICH SOUNDS RATHER EXOTIC, I MIGHT EXPLAIN THAT IT REGARDS THE MAINTENANCE OF TWO LIGHTHOUSES ON THE ISLANDS OF ABU ALI AND JABAL AT TAIR IN THE SOUTHERN END OF THE RED SEA. THE ISLANDS HAVE BEEN OCCUPIED BY THE BRITISH SINCE THE END OF WORLD WAR I, BUT BECAUSE THEIR SOVEREIGNTY NEVER HAS BEEN SETTLED, WE PARTICIPATE WITH OTHER COUNTRIES IN THE UPKEEP OF THE LIGHTHOUSES. WITH THE SUEZ CANAL BLOCKED, HOWEVER, THE LIGHTS OBVIOUSLY AREN'T GETTING MUCH WORK. THESE ARE SOME OF THE GROUPS THE AMERICAN TAXPAPER IS HELPING TO UNDERWRITE WITH OUTRIGHT DONATIONS OF HUNDREDS OF MILLIONS OF DOLLARS. THE U:N., OF COURSE, IS FAR OUT IN FRONT-- AND IT PROBABLY WILL STAY FAR OUT FRONT. THE U.N. BUREAUCRACY APPEARS TO BE VERY MUCH LIKE OUR OWN WASHINGTON BRAND. IT JUST KEEPS EXPANDING. IT MAY ACCOMPLISH NO MORE THAN BEFORE, BUT PROGRAM PLANNERS KEEP THINKING OF NEW WAYS TO SPEND OTHER PEOPLE'S MONEY -- AND AT THE SAME TIME FURTHER ENTRENCH THEMSELVES IN THEIR PLUSH LITTLE EMPIRES. AMERICAN PEOPLE ARE GOING TO BE ASKED TO FORK OVER NOT ONLY THE WHOPPING SUM OF $109,116,000 BUT AN ADDITIONAL $20 MILLION TO HELP THE U.N. WITH ITS AMBITIOUS BUILDING PROGRAM. THE TOTAL COST OF THE ADDITIONAL STRUCTURE IS ESTIMATED AT $80 MILLION, WHICH MEANS OUR SHARE OF THIS NEW MONUMENT TO FUTILITY WILL BE 25 PERCENT. AND, DON'T BET THAT WE WON'T BE ASKED TO KICK IN MORE, EVEN THOUGH THIS IS LISTED AS A ONE-TIME CONTRIBUTION. THE U.N. FUNDS REPRESENT THE BIG CHUNK OF OUR DONATIONS TO INTERNATIONAL ORGANIZATIONS. THE ESTIMATED TAB FOR FISCAL 1969 WAS $130,187,000. IN THE 1971 BUDGET, THIS CATEGORY IS DOWN FOR $144,611,000. ATTRIBUTES THE INCREASE IN U. N. FUNDS TO A RECENT SALARY INCREASE FOR PROFESSIONAL STAFF, INCREASES IN STAFF, ADDITIONAL COSTS FOR CONSTRUCTION, RENTAL AND MAINTENANCE OF PREMISES, INCREASING CONFERENCE COSTS AND ADDITIONAL FUNDS NEEDED FOR U.N. AFFILIATES. AS YOU CAN SEE, THE INFLATIONARY SPIRAL IN AMERICA DOES NOT STOP AT THE INTERNATIONAL ZONE, AND AS WITH EVERYTHING ELSE, IT'S THE POOR AMERICAN TAXPAYER WHO GETS IT IN THE WALLET. DISEASE CONTROL AND ENVIRONMENTAL HEALTH. THESE ARE LAUDABLE ACTIVITIES. I CAN ONLY HOPE THEY ACCOMPLISH THEIR PURPOSES AND DON'T GO THE WAY OF MANY OF OUR OWN WASHINGTON PROGRAMS THAT BECOME HAVENS FOR BUREAUCRATS AND DO LITTLE FOR THE PUBLIC. I MENTION THIS BECAUSE ONE OF THE U.N. PROGRAMS WE'RE FUNDING SO GENEROUSLY APPARENTLY ISN'T BEING RUN VERY WELL. I REFER TO THE FOOD AND AGRICULTURE ORGANIZATION, WHICH GOT A CONTRIBUTION OF MORE THAN $8 MILLION IN THE PRESENT FISCAL YEAR AND IS DOWN FOR AN INCREASE TO OVER $10 MILLION IN FISCAL YEAR 1971, WHICH STARTS JULY FIRST. BY THE STATE DEPARTMENT ON THE GROUNOSTHAT FAO IS EXPANDING A JOINT PROGRAM WITH THE WORLD BANK, BEEFING UP ITS DEVELOPMENT AND FISHERIES DEPARTMENTS AND EXPANDING ITS FORESTRY WORK. SOUNDS PETTY CONSTRUCTIVE. BUT WAIT. LET'S TAKE A LOOK AT THE FAO. THIS U.N. ORGANIZATION IS SUPPOSED TO FOSTER INTERNATIONAL COOPERATION IN THE FIELDS OF NUTRITION, FOOD AND AGRICULTURE. ITS PROGRAMS ARE FINANCED WITH FUNDS CONTRIBUTED DIRECTLY BY ITS MEMBER NATIONS AND WITH FUNDS ALLOCATED BY THE U.N. FAO ALSO, JOINTLY WITH THE U.N., ADMINISTERS THE WORLD FOOD PROGRAM. $219 MILLION TO THESE PROGRAMS, INCLUDING $92 MILLION IN FOOD. ACCORDING TO THE COMPTROLLER GENERAL, THE DEPARTMENTS OF STATE AND AGRICULTURE, WHICH ARE SPONSIBLE FOR DIRECTING AND COORDINATING OUR FINANCIAL PARTICIPATION IN THESE PROGRAMS --- WELL, THEY APPARENTLY AREN'T DOING THEIR JOB. TO MAKE ADEQUATE ANALYSES OF FAO ACTIVITIES. 'THE U.S. GOVERNMENT HAS NO FIRM BASIS FOR MAKING INFORMED JUDGMENTS, EXCEPT IN VERY BROAD TERMS, AS TO JUST WHAT FAO IS DOING OR PLANS TO DO WITH THE CONTRIBUTIONS IT HAS RECEIVED. THIS IS A PRETTY SERIOUS INDICTMENT. THE COMPTROLLER GENERAL'S LANGUAGE IS EXCEEDINGLY RESTRAINED AND CIRCUMSPECT. WHAT IT AMOUNTS TO IS A PRETTY STRONG CONDEMNATION OF THE BUREAUCRATS IN OUR GOVERNMENT FOR NOT DOING THEIR JOB AND SEEING TO IT THAT THE MONEY WE GIVE THIS ORGANIZATION IS SPENT SANELY. NOW, I HAVE BEEN RATHER CRITICAL OF SOME OF THE AREAS OF FOREIGN AID RECEIVING GREAT GOBS OF OUR LARGESSE. SO LET ME CONCLUDE ON AN UPBEAT. THE FOOD FOR FREEDOM PROGRAM IS PERHAPS THE MOST TRULY HUMANITARIAN OF ALL OUR AID PROGRAMS, AND ITS BENEFITS FLOW IN MANY DIRECTIONS. THE AMERICAN FARMER LIKES IT BECAUSE IT PROVIDES ANOTHER SOURCE OF REVENUE; THE STATE DEPARTMENT LIKES IT BECAUSE IT HAS CREATED MUCH GOOD WILL; THE IMPOVERISHED NATIONS OF THE WORLD LIKE IT BECAUSE THEY CAN FEED THEIR HUNGRY AT LITTLE OR NO EXPENSE. OF COURSE, THERE IS A NEGATIVE ASPECT. IT'S ADMITTEDLY EXPENSIVE. THE PROGRAM ANNUALLY COSTS THE AMERICAN TAXPAYER BETTER THAN 1 BILLION DOLLARS. THE FOOD FOR FREEDOM PROGRAM IS EXTREMELY COMPLEX. AS TO FINANCING, IT ALLOWS OUR COMMODITY CREDIT CORPORATION TO SELL OR GIVE AWAY SURPLUS FOOD. MOST OF THE COUNTRIES BUYING THIS FOOD PAY FOR IT IN THEIR OWN CURRENCIES, WHICH ARE HELD IN THE COUNTRY AND USED EITHER BY OUR GOVERNMENT FOR ITS OWN PURPOSES, SUCH AS IN BUILDING MILITARY HOUSING, OR FOR ADDITIONAL AID PROJECTS WITHIN THE COUNTRY. INDIA HAS BEEN THE GREATEST BENEFICIARY OVER THE YEARS -- WELL OVER $3 BILLION WORTH. NOW, SINCE MOST OF THE MONEY COMES TO US IN FOREIGN CURRENCY HELD WITHIN THE COUNTRY, THE QUESTION ARISES: HOW IS THE FOOD PAID FOR OVER HERE? SIMPLE--ASIT DOES WITH ABOUT EVERYTHING ELSE, CONGRESS EACH YEAR APPROPRIATES FUNDS TO REIMBURSE THE COMMODITY CREDIT CORPORATION. THERE IS ANOTHER NEGATIVE ASPECT ABOUT THIS PROGRAM. WE HAVE LOST ABOUT $1 BILLION, HALF OF IT IN INDIA ALONE, AS A CONSEQUENCE OF DEVALUATION OF CURRENCY. WHAT HAPPENED WAS THAT WE HAD NO AGREEMENTS TO MAINTAIN THE VALUE OF THE CURRENCY WE WERE HOLDING --AND SO WHEN IT WENT DOWN, THE DOLLAR VALUE OF WHAT WE HAD IN THESE COUNTRIES ALSO WENT DOWN. ONE BILLION DOLLARS WORTH. WITH THIS PROGRAM BECAUSE THEY SHOW THAT EVEN IN OUR BEST-INTENT!OWED FORAYS INTO FOREIGN AID WE INEVITABLY TAKE SOME SORT OF BEATING. I HAVE TRIED TO SHED A LITTLE LIGHT ON SOME OF THE ASPECTS OF FOREIGN AID WE GENERALLY DON'T READ OR HEAR ABOUT. THERE ARE 21 AREAS ASIDE FROM THE ACTUAL FOREIGN AID BILL THAT MUST BE FUNDED ANNUALLY BY CONGRESS, MEANING THE AMERICAN TAXPAYER. MAGNITUDE OF OUR EFFORTS AROUND THE WORLD. WE TRULY ARE CARRY ING THE WORLD ON OUR BACK -- IS IT ANY WONDER WE ARE BEGINNING TO BEND?